It’s that time of year again, when thoughts turn to Champagnes and sparkling wines. Prosecco may have changed the category, becoming the year-round drink of choice for many people, but the festive season still sees overall sales of sparkling wines soar. For most of us Christmas and New Year celebrations are only complete with a soundtrack of corks popping and bubbles pouring. I’m a huge fan of sparkling wine, occasionally frustrated that it is not always seen as ‘real’ wine. Its subtleties and complexities are so often under-appreciated. But of course that does not apply to every sparkling wine, and nor should it perhaps: there’s no denying that the feel good factor of enjoying without too much reverence is OK too. This round-up of over 30 examples spans wines from a variety of regions and styles, and from the cheap and cheerful to some of the world’s great sparkling wines. 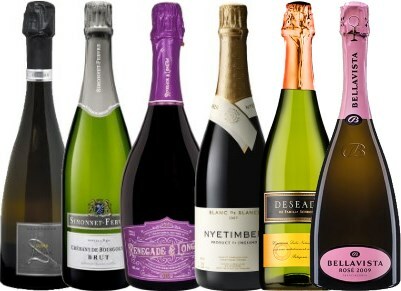 I’ve grouped the wines as: under £15; £15-£30 and over £30, plus I’ve included a bunch of low or no-alcohol sparkling examples, a category that seems to be growing. I’ve yet to taste an alcohol-free wine, sparkling or still, that could perfectly substitute for the real thing, but as there are some interesting innovations in this sector and very pleasant drinks, so I thought it worth having a sniff and taste of a few. This price range is dominated by Prosecco of course. 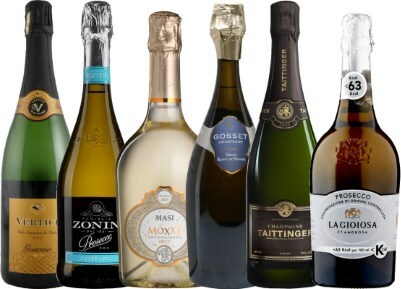 There’s a lot of wine labelled Prosecco that does not distinguish itself, but you’ll find some exampls of interest below, and I recently wrote about a dozen more expensive Proseccos too. Many of the Crémant wines of France hit this price point too, wines made by the traditional method in various regions other than Champagne. Cava is seeing something of a revival of interest, though many that I have been tasting recently have been superior cuvées at slightly more ambitious prices around £20, so do not feature in this category. (2018) Nothing remarkable about this Prosecco from The Wine Society, and nothing objectionable either: pre-requisite fresh pear, lemon and icing sugar aromas, a lively and sherbetty palate, and it is Brut, so a bit drier than your average supermarket label, which is for the good. Very decent quaffing Prosecco. (2018) Another Brut Prosecco, so with less than 12g/l of residual sugar, this is a forthy and crowd-pleasing style, though with a deal of elegance and refinement. The nose is filled with crisp pear aromas, with delicate floral and icing sugar nuances, before a palate that has a good backbone of acidity, and that moderate sugar giving both a hint of sweetness and a nice lemony, sours freshness to the flavour profile. (2018) A low alcohol blend of Zweigelt, Pinot Noir, St Laurent and Blaufränkisch, I guess this would count as a 'Pet Nat', a trendy new term for gently sparkling 'natural' wines and this has the credentials: biodynamic, closed with a beer bottle crown-cap and with only 10.5% alcohol. It is only gently effervescent, the colour lovely ruby/pomegranate red, with delicate strawberries and cream aromas. In the mouth the frizzante style gives a lively edge to crisp and flavourful red berry fruit, a hint of sweetness swept up in lovely, clear apple core dry acidity. Delightful. (2018) Not a million miles away from that other great medium-sweet, gently sparkling wine style, Moscato d'Asti, here Torrontes presents a fragrant bouquet of wild flowers, nettle, orange and peach, before a palate that has plenty of sweetness and a light, gossamer mousse, before bright mandarin orange acidity balances the finish. Very unusual, great for Christmas morning with a mince pie, or with Thai cuisine. (2018) Crémant wines are undergoing something of a mini-boom, finding many new fans for these traditional method sparkling wines from French regions outside of Champagne. This, from Chablis producer Simonnet-Febvre, is a blend of Chardonnay (60%) and Pinot Noir, aged 24 months on the lees in bottle. It is a crisp and zippy style, but a creaminess and touch of biscuit adds to the pear and lemon fruit of the nose. In the mouth it is razor-sharp as befits a wine from vineyards surrounding Chablis, but there is a juiciness and peachy generosity to the mid-palate fruit before that long, shimmering core of acidity extends the finish. Watch the video for more information and food-matching ideas. (2018) The high quality Prosecco house of Canevel makes its wines in conjunction with the renowed Masi estate of nearby Valpolicella, this off-dry wine from the hillsides of Valdobbiadene in Prosecco being 100% Glera. Very fine, very racy, a golden delicious ripeness, then the 16gl of sugar and a certain peachiness absorbed into the racy sherbet lemon clarity of the fruit and acidity. A balanced, dry impression on the finish despite the sweetness of the sugar being quite obvious. (2018) Made by the traditional method, this is a dry and very grown-up take on elderflower wine, with 7g/l of residual sugar and 12% alcohol by volume. Pale and moderately effervescent, aromas are floral and herbal, not the pungent 'cat's pee' elderflower used to describe many a Sauvignon Blanc. In the mouth it has a fine mousse and it is dry, a keenly honed acidity driving, the flavour difficult to describe: herbal, a touch of endive bitterness, with a lemon peel zestiness too. A successful wine, perhaps more akin to a Loire Crémant than a Champagne, for want of a better way of describing the flavours. (2018) I rather liked this blend of elderflower with blackberries, rhubarb, and strawberries, with second fermentation in bottle a la Champagne.The pale colour and small bubbles are attractive, and the nose is not too sweet and not too elderflowery, the dry rhubarb and cranberry character and modest yeastiness the main players. On the palate it is dry, perhaps even a touch astringent, but that gives it a bit of sour and savoury grip against the berry fruits that are a little more obvious in the mouth. Stylish. (2018) Made by the winemaking students of England's Centre of Excellence for wine education, supervised by expert winemakers, this sparkling blend of 43% Pinot Meunier, 38% Chardonnay and 19% Pinot Noir was disgorged on 8th May 2018 after three years ageing on the lees, with little over 2,000 bottles produced. It is an absolute charmer, a touch of luscious gold to the colour and a rich butter pastry nose, loads of biscuit and ripe, juicy orchard fruits. The palate has a soft cushion of mousse and there is an open, welcoming breadth to the sweet fruit core, but then the finish sharpens up nicely with dazzling lemony acidity. Really very good indeed. Price is per bottle, available in cases of six from the college, but use the wine-searcher link to find other stockists. (2018) What a beautiful all-Chardonnay wine this is from Greyfriars in Surrey, a little extra time in bottle post-disgorgement now showing lovely creaminess and yet full fruit, pear and apple, yes, but almost a soft summer berry character, the rich mousse leading to a taut, defined finish. The 2014 is the wine in stock with several other retailers at time of review. Dominated by Champagne and English sparkling wine, Italy’s Franciacorta is another sizeable player in this price range, though I did not come across too many in the run up to Christmas this year. But look out for superior Cavas pitching at this slot. For a change I have also focused more than usual on ‘grower’ Champagnes from small, usually family-owned estates, rather than the better-known Grand Marque houses. (2018) A small proportion of the Chardonnay for this cuvée from Nyetimber was barrel-fermented, and the wine was released only after a full five years on the lees. Pale straw/gold, with very small bubbles, the yeasty development is inviting, a touch of biscuit against the crisp summer orchard fruit. In the mouth it seems to have quite a sweet edge to the fruit, perhaps towards the top of the 'Brut' range I'd guess, and that, plus the creamy lees character, gives a slightly softer finish despite the wine retaining good zippy acid. It also makes it a very pleasing wine to sip, or match with white fish and sushi. (2018) From Champagne's oldest house, founded in 1584, the blend is 45% each of Chardonnay and Pinot Noir, the balance Pinot Meunier, and this bottle is blend of three recent vintages given four years ageing in the Gosset cellars. Despite that softening time on the lees, this is a Champagne with drive and purpose, the nose nuanced with pastry and almond over citrus and stone fruits, but the palate quite steely and very focused, the vibrant but not lean focus of citrus driving through against the creaminess of the mousse in very food-friendly style. The price quoted at time of writing is the cheapest I can find (on offer), but it is quite widely available at under £50.